Get Inspired: "Steal Like An Artist"... without getting sued! — You Can Brand! 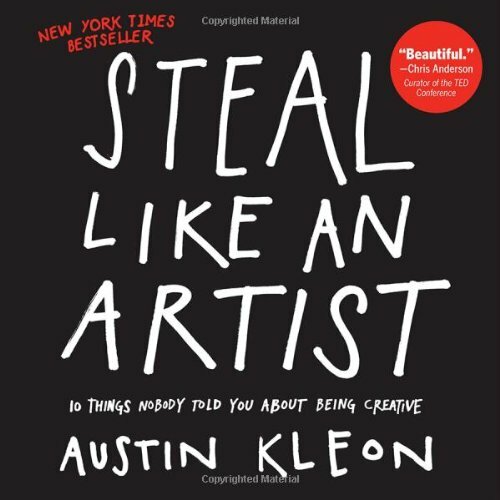 While visiting one of my favorite cities last month, Portland, Oregon, I came across this book: Steal Like an Artist by Austin Kleon. I could not put it down to save my life, and had to splurge the whole $10 for it. It was quite the steal....ahem... pun totally intended! This book went into how all of the greatest ideas out there come from getting inspired from people who are already successful, but of course by improving upon what they've done and doing so in a way that was truly unique. I have been an avid believer in this for a long time and constantly tell my students to stop trying to be completely original geniuses without any help! The pressure they put on themselves sets them up for getting frustrated, scared, and without ideas, which ends up encouraging them to create sub-par mediocre work that might be original but it many times looks unprofessional and far from ground breaking! Imagine trying to draw or paint the most beautiful piece you could ever imagine without looking for anything as a reference? Looking at the line strokes of Picasso, or even a piece of fruit for reference. Some people can draw from their imagination, but those who study the form of something as their drawing it can create much better work! You want to get inspired from color, shading, line styles, shapes, lighting etc. To learn how to design or create a brand you must deconstruct things and put them back together to truly understand how they work. This incessant pressure to have to create every single element from scratch is something that should come with time and skill, and not to stop you from progressing as a designer, or branding yourself as an entrepreneur. Jenna Says "Lack of creative analysis, creates creative paralysis!" Quote me on this! Find a couple handfuls of well-designed pieces that inspire you... ie. the feeling that gives you the "I want my work or (company's branding) to look that __(adjective)____ cool, stylish, modern, professional. You can find well-designed materials at www.behance.net You want to gather many pieces of inspiration and draw from all of them. Deconstruct pieces to fully understand how to put things together. Answer questions about what it is exactly do you like about the logo, ad, website, business card, art piece you are looking at? Do you like the colors? Do you like the concept? Do you like the typography? Photography? Layout? What makes any of those things speak to you? Example: "I love the grittiness of the photograph. I love the huge typeface that takes up the top part of the page and the script font next to it." Take a picture of it, or save from the web, and put it into a file for future reference regarding the project you are working on. You can also do this via Pinterest by creating your own private or public inspiration board. (see my example of an inspiration board above) What's great is that you'll start seeing trends! This will help you understand what you love, and ultimately what your style is. Recreating designs with your own personal style As a designer for practice, not for public consumption, it's okay in the privacy of your own home to pull in an inspired piece and recreate it in it's entirety. You can't stop there because that would be a derivative work. You will learn so much about design elements by doing this. The final output needs to be visually very different enough that the original is not identifiable through your piece. I decided to use a design piece from my own portfolio here. To illustrate how you can get inspiration without it being a work of plagiarism. So for the sake of this example, let's pretend you found something from my portfolio and you thought to yourself "I LOVE THIS!" and you got some amazing ideas on how it could apply to your jewelry company. Let's say when you saw this you thought to yourself, wouldn't it be cool if I could get a necklace to fall over letters like this? Notice the concept is similar but look how it has new typography, new imagery, new colors, new layout change the overall aesthetic to be different than the inspired piece. The concept of something drooping over a bold font, is not copyrightable. If the aesthetic starts to get too similar you might have an issue of it looking like a rip off, so you really want to make it very different. Why can't you just make a derivative work? Isn't that the same as inspiration? The issue with derivative works is that they require permission from the original artist to use, and you take the chance of getting sued if you don't. So ultimately your best bet is to get inspiration from many pieces and to not copy exactly. If the artist can identify something specific about a piece -- let's say a combination of 2 or more elements together, it could create problems. NOTE: An idea cannot be copyrighted, nor can facts, lists, systems, etc. Check out more information from the Copyright Office For example it would be considered copyright infringement to create a book with the school Hogwartz and the characters Harry Potter, but you could however create a book about children going to a wizard school though! So this is the difference between taking inspiration vs. copyright infringement. Ultimately a derivative work mean that a part of it could be identified as a direct duplication of the original! We have seen famous artists get in trouble for this. Shepard Fairey was sued by a freelance photographer from the Associate Press for his creation of the infamous "Obama Hope" poster. . How was it identifiable? This handy little chart shows you! This is a debatable subject! What do you think about inspiration vs. imitation, and appropriation? Where is the line drawn? How do you use inspiration without crossing the line into direct imitation?